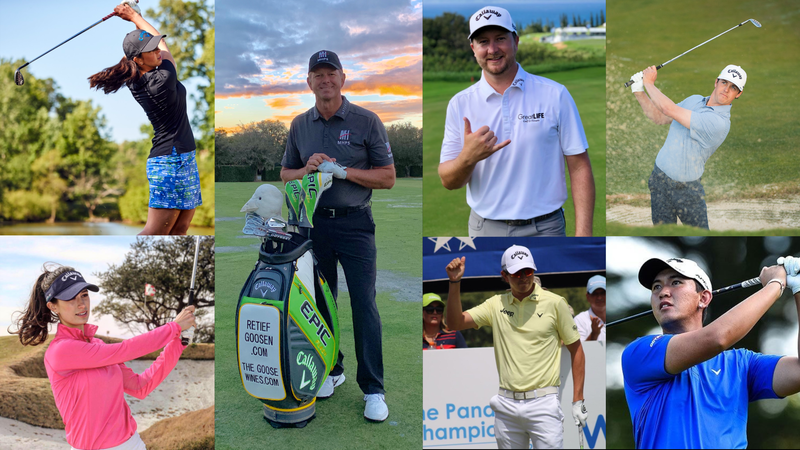 Callaway® Apparel Welcomes 15 New Brand Ambassadors For 2019 – "The Home of Organic Golf Reviews"
(Miami, FL, April 4, 2019) — Callaway Apparel is pleased to announce the signing of sixteen new brand ambassadors, joining current staffers Talor Gooch, British Open winner Georgia Hall, two time U.S. Open winner Lee Janzen, Pablo Larrazabel and Renato Paratore. ● Retief Goosen – This two-time Major Champion owns 36 career wins worldwide and has spent over 250 weeks in the Top 10 of the Official World Golf Rankings. Later this year, he will be inducted into the World Golf Hall of Fame as a part of the Class of 2019. ● Brice Garnett – Winner of the 2018 Corales Puntacana Resort and Club Championship. He is also a multiple winner on the Web.Com Tour and former NCAA Division II All-American. ● Cody Gribble – Winner of the 2015 Sanderson Farms Championship and a member of the University of Texas 2012 National Championship team. Cody will be wearing Callaway TOUR AUTHENTIC in 2019. ● Brandon Harkins – He recorded eight Top-25 finishes during the 2017-18 PGA Tour season and earned his 1st FedExCup Playoff appearance. ● John Chin – The PGA Tour rookie earned his 2019 PGA Tour card after finishing 17th on the Web.com Tour in 2018. ● Roberto Diaz – Finished second at the 2018 World Cup of Golf as a member of Team Mexico. ● Steven Brown – The second-year European Tour member has earned three professional wins and was a member of the 2011 GB&I Walker Cup team. ● Rico Hoey – A three-time All-American at USC and two time Palmer Cup member will be competing in his first full season on the Web.Com Tour in 2019. ● Nicolas Echavarria – A two-time winner on the PGA TOUR Latin America in 2018, he finished #2 in the Order of Merit earning his place onto the 2019 Web.Com Tour. ● Andres Gallegos – #5 on the 2018 PGA TOUR Latin America Order of Merit and winner of the 2018 Puerto Plata DR Open. ● Steven Ihm – The University of Iowa grad will be competing on his first full season on the Web.com Tour. He is a former winner of the prestigious 2013 Sunnehanna Amateur. ● Matthew NeSmith – The Web.Com Tour rookie was a two-time All American and the winningest golfer in University of South Carolina history. ● Carlota Ciganda – The 15th ranked player in the world has earned six career wins, played on three Solheim Cup teams and was the LET Rookie of the Year. ● Emma Talley – A past winner on the Symetra Tour, the four-time All-American at the University of Alabama is one of only five women to win both the NCAA Individual Championship (2015) and U.S. Women’s Amateur (2013). ● Cheyenne Knight – This LPGA Tour rookie was an All-American all three years she spent at the University of Alabama and earned the 2017 SEC Player of the Year. Innovative. Performance-Driven. Authentic. Callaway® Apparel is the ultimate combination of golf authenticity and classic style. Always innovative, always an outperformer. Because apparel that offers quality, performance, functionality and fit is as important to both men and women golfers as the equipment they use. Callaway Apparel is designed for those who love the game of golf. It represents where the game has been, and where the game is going. Learn more about Callaway Apparel at www.callawayapparel.com and follow on Facebook, Instagram, and YouTube. Perry Ellis International, Inc. is a leading designer, distributor, and licensor of a broad line of high-quality men’s and women’s apparel, accessories and fragrances. The company’s collection of dress and casual shirts, golf sportswear, sweaters, dress pants, casual pants and shorts, jeans wear, active wear, dresses and men’s and women’s swimwear is available through all major levels of retail distribution. The company, through its wholly owned subsidiaries, owns a portfolio of nationally and internationally recognized brands, including: Perry Ellis®, An Original Penguin® by Munsingwear®, Laundry by Shelli Segal®, Rafaella®, Cubavera®, Ben Hogan®, Savane®, Grand Slam®, John Henry®, Manhattan®, Axist® and Farah®. The company enhances its roster of brands by licensing trademarks from third parties, including Nike® for swimwear, and Callaway®, PGA TOUR®, and Jack Nicklaus® for golf apparel and Guy Harvey® for performance fishing and resort wear. Additional information on the company is available at http://www.pery.com.